Running a nonprofit is no easy feat. There are so many factors you must take into consideration that the idea of conducting prospect research and wealth screenings can seem daunting. However, there is truly no better way to manage your nonprofit than to fully understand the actions, preferences, and makeup of your donors. Without this knowledge, you are unable to make informed decisions about your fundraising strategy, hindering your ability to best engage with your donors. Donor analytics tools are your best bet to help you understand your donor community. How can donor analytics impact fundraising? Which donor data should nonprofits track? What donor analytics tools are worth the investment? How can donor analytics help nonprofits plan ahead? Getting to know your donor community starts with a keen understanding of donor analytics data and software tools. Let’s dive into these essential questions so your team has what it needs to start fundraising more effectively! 1. What are donor analytics? Whether you are an up-and-coming nonprofit organization or have been firmly established for years, understanding your donors should be one of your top priorities. In order to sustain the good work that you do, you need to gain supporters and retain the ones you already have relationships with. Donor analytics break down and interpret donor data to help you understand trends in your donor base and provide actionable insights. They help you make more informed decisions when pursuing constituent relationships. Donor Capacity: The ability of an individual to give. Donor Affinity: The likelihood that an individual would give to your organization. Wealth screening is a major donor analytics tool that allows your nonprofit to assess the wealth capacity and personal affinity of existing and potential donors in a way that is both efficient and most useful to your organization’s team. Donor capacity and affinity, however, are broad concepts, and you should be measuring concrete evidence before you draw any conclusions. Wealth and philanthropic indicators are used to determine an individual’s capacity and affinity, respectively. These indicators can take many forms and if you are analyzing your own data, it may be a bit mind-boggling. Data analytics software, then, takes the burden off of your shoulders and allows you to act on the results it provides. 2. How can donor analytics impact fundraising? A successful fundraising campaign takes a lot of planning. An effective strategy is impossible to design if you are unaware of who you need to target. Donor analytics provides you with the information and resources you need to accurately allocate your time and energy. Why spend countless hours attempting to gauge how you should structure your next fundraising campaign, when you can easily gain all of the information you need to set an educated course of action? What is my fundraising goal? Make sure you set realistic goals. Analyzing your donor data and trends can help you determine how much money you can expect to gain through fundraising. Using this information to help set your fundraising goal will increase the likelihood that you achieve your goals. Who am I targeting? Having immediate access to your donors’ previous giving information will drastically increase the amount of meaningful connections you are able to make during your fundraising campaign. The more you know about donors who have already given to your cause, the better equipped you’ll be to identify new givers who fit your established donor type. When should I make my request? Different seasons are more likely to inspire certain people to give in different ways. Donor analytics tools bring to the forefront the giving patterns that will allow you to see the best times of the year to make your requests. How much should I request? Access to past giving patterns and wealth markers will allow you to request reasonable amounts from prospective donors. 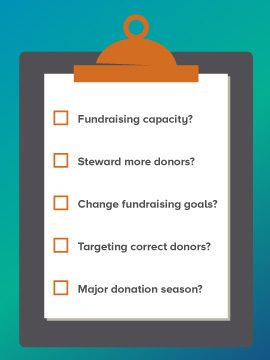 Not only will this help your team set reasonable asks, but it will also help you identify opportunities to upgrade past donors. Which method should I use to reach my target audience? You can’t effectively steward gifts from all of your donors in the same way. People prefer to communicate and donate in a variety of ways, and your organization should take this into account when it reaches out to donors. Donor analytics tools can filter and organize your data for any variable and will enable you to easily see their preferences. Your fundraising campaign should be tailor-made for your target audience. But in order to structure your fundraising campaign, you need to have a means by which you can organize, filter, segment, and process data for your convenience. 3. Which donor data should nonprofits track? Your nonprofit should use prospect research and wealth screening software to identify philanthropic and wealth markers among your community. Understanding your donors and potential donors will greatly inform your fundraising strategy. The best wealth screening and prospect research software will take a wide range of factors into consideration. Wealth markers are an extremely important component of your donor data that your nonprofit needs to track. Approximately 80% of your funds will come from 20% of your donors. While most of this data is public knowledge, compiling, organizing, and analyzing the data without a data analytics tool would take up valuable time that you could be using to steward gifts. Wealth screening software, therefore, is an absolute necessity for your next fundraising campaign. 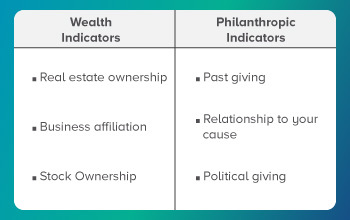 Take a look at some of the following common wealth indicators so that you can know what kind of donor data you should be keeping your eye on. Donor investment in real estate is an excellent way to appraise a donor’s earning and giving potential. Individuals who own $750k-1 million in real estate are 2 times as likely to give charitably. Meanwhile, individuals with $2+ million invested in real estate are 17 times more likely to donate their money to a nonprofit organization. While this marker is not a perfect guarantee of accuracy, there is a strong correlation between people with higher rates of real estate ownership and people who give charitably that cannot be ignored. A person’s business affiliation can refer to a variety of connections, but it all boils down to an individual’s role in a major corporation. Whether this means they are an executive, a board member, or a major investor, it is important to note for reference. A person’s affiliation with a corporation will imply their net worth and earning potential. This aspect of donor data is also valued more for its indication of a person’s high-value connections that you could, in turn, leverage to steward even more major gifts. Like a person’s business affiliation, stock ownership indicates not only wealth, but important connections with major companies. Are an officer or director of a company. Own more than 5% of shares. Keep in mind that SEC insider stock transactions only report on stock holdings for public companies and may not fully capture the giving capacity of an individual with large privately owned stocks. Wealth markers and giving capacity, while valuable data to track, are nowhere near as important as philanthropic markers. The richest person in the world can still be an unstrategic ask if they do not have any tendency toward charitable giving. You need to know the giving affinity of your prospective donors if you are going to know who to steward for gifts. Take a look at these key philanthropic markers. Giving history is the single best indicator of a person’s likelihood to give to your organization. This does not only refer to a person’s history with your organization, but also includes all past charitable giving. Prospect research software should use an RFM score as a baseline for its donor analytics and provide you this information in a meaningful and actionable way. Recency of the last gift. Understanding an individual’s giving pattern is essential when planning how to approach them for gifts. This will allow you to sort through your existing donors for those most likely to continue giving to your organization as well as mark individuals whose giving affinity matches your organization’s cause. Donor retention is the key to a successful nonprofit. You want your donors to give, and keep giving, because they believe in the work that your organization performs and the good that you do. Use prospecting software to analyze volunteer and donor profiles to assess a person’s readiness to contribute to your organization. But don’t forget to continue your outreach and stewardship beyond just your own donor list. Data analytics tools can enable you to study the giving history of individuals in your community to see their affinity for organizations whose work is similar to your own. If you can see that they have given to organizations with a similar cause, then they have a greater likelihood of wanting to support your organization. People who give $15,000+ to the Federal Election Committee have an equal likelihood of gifting anywhere from 1,000-1,000,000+ to nonprofits. Luckily, the FEC requires all donors to provide their name, gift amount, occupation, address, and date of giving. This will allow your organization to better build out potential donor profiles and examine them for potential donors of major gifts. Without the right tools, however, the wealth and philanthropic markers can be hard to correlate and make sense of. 4. What donor analytics tools are worth the investment? By now, you know your nonprofit should invest in wealth screening and prospect research software, but how do you know which tools you need and which your organization can do without? Complete customization. Your donor analytics software should have a completely customizable format and account tools that will best facilitate your use. Don’t let yourself become tangled in a complex new software interface when you could be using that time to achieve your fundraising goals. Integrated search. This should allow you unlimited searches into individuals’ wealth and philanthropic data so that you can create philanthropic and wealth profiles. Make sure your search tool allows you to add custom fields to search and sort by for optimal results. Prospect generator. Once you have exhausted your donor list, a prospect generator tool will find new prospective donors for you based on individuals’ known philanthropic giving to other similar organizations. This tool should allow you to create a custom donor list, using a wide range of demographic, financial, and preferential categories. Gift search. With so much importance placed on philanthropic indicators, this tool becomes invaluable. It should provide further information about your prospects’ giving history. You can learn who gave a gift, how much was donated, and where and when they donated it. Batch screening. If you have an extremely long donor list that would take too much time to screen one-by-one, you should be able to do batch screening. The right software platform will screen large batches of donor data for you and return accurate results in a timely manner to reduce the amount of time you have to spend screening your donors. Planned giving screening. Planned giving has the potential to bring in major gifts to your nonprofit, but these donors can be difficult to identify. It is likely they may not be current major gift donors or even affiliated with your organization at all. This tool will help you identify prospects that will likely make planned gifts to your nonprofit. 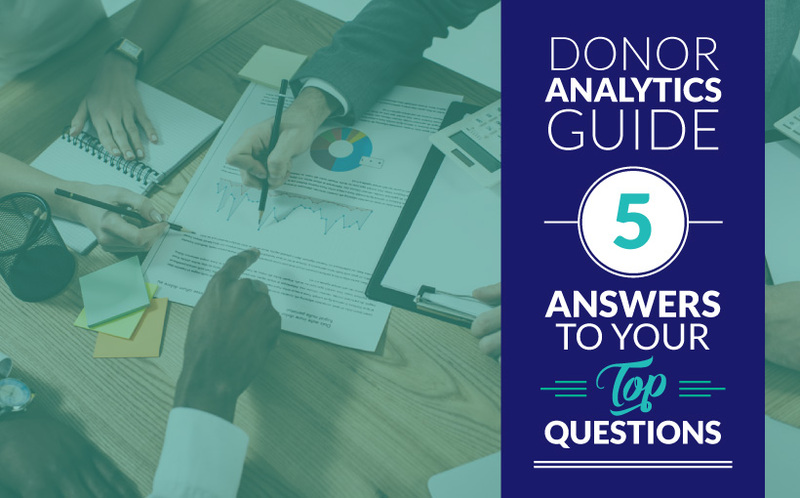 As long as your software is equipped with these essential data analytics tools, your nonprofit organization will be well-situated to understand its existing donor base and extend its reach to new prospects. 5. How can donor analytics help nonprofits plan ahead? Understanding the data behind your nonprofit’s community isn’t just about making informed decisions today. It can also help you plan for the future. No matter the community your organization serves, you inevitably run into obstacles when you are planning your fundraising strategy. What is my fundraising capacity? To effectively fundraise, you need to know the extent of your nonprofit’s fundraising capacity. This may include assessing the value and effectiveness of your donor management software, or the number of fundraising officers you have available to work consistently on your campaign. Don’t forget you need to take into consideration other similar nonprofits operating in your community who may rival your nonprofit for donors. If you are a faith-based organization who stewards local donors around religious holidays, be aware that other organizations with similar goals will likely use similar tactics, and adjust your plan accordingly. When you are planning for your nonprofit’s future, you must take a wide range of factors into consideration to ensure you are prepared for any challenge you might face. By employing donor analytics software, with all of its tools at your disposal, you could use concrete evidence to better gauge your nonprofit’s upcoming success. For example, if your nonprofit wants to grow its fundraising capacity by 20% in the upcoming year, you should be able to assess whether or not your current donor community could sustain that growth. If not, you can steward more donors to reach your goal. Do I need to steward more donors? As a nonprofit fundraising officer, you should always have an eye on your fundraising goal. But what happens when you realize that on your current trajectory, you will fall short of your desired goal? If you understand how much more you need to fill the gap between your current plan and your ultimate goal, you can leverage what you know to determine the number of high-capacity donors you’ll need to steward to reach your goal. Understanding your donor data and utilizing the right donor analytics tools will allow you to assess your nonprofit’s needs and create an actionable plan to achieve your goal. If you can see your prospective donors’ donor profile, you will be able to determine their likelihood to donate to your organization and who you should approach for your next campaign. Would it be more prudent to change my fundraising goals? Sometimes, despite best efforts, it is more sensible to change your fundraising goal to fit your nonprofit’s fundraising ability. The success of your nonprofit depends on setting reasonable, achievable goals for each campaign and recognizing when you need to change them. Your fundraising goal should always stay ambitious, but don’t overextend your team. If you plan your upcoming events anticipating a fundraising income that you don’t meet, you would then have to cancel or rescind your upcoming work for your cause. This will likely reflect poorly on your organization. For example, if you are a private school or education center, imagine promising a new gym facility to your students, based on inaccurate estimations of fundraising capacity and then have to deny your students a gym when you do not meet the goal. You should always act and plan on the most accurate information possible so that your tough decisions can be made with the clearest picture of your nonprofit’s abilities in mind. Donor analytics will provide you all the information you need to make an informed decision. Am I targeting the correct donors for my needs? Your time and resources are incredibly valuable and you should be aware of how you spend them. Don’t waste time pursuing donors whose capacity or affinity differs from your needs. This will only end in disappointment. With prospect research tools you can be sure you are not targeting donors who exclusively give to faith-based organizations when you are a health care association. It can be difficult to take into account all of the factors that determine donors’ giving patterns. Prospect research tools can take care of the difficult parts for you and simply give you actionable insights into the donors you should target. Am I stewarding my donors when they are most likely to give? Timing is everything when it comes to stewarding donors for gifts. But how do you know when you should be making your ask? Donor analytics tools record donor data regarding past giving so that you can know when individuals normally make their gifts. With this information, you can be sure to solicit gifts from donors during fundraising seasons in which you know they have been active. This will likely reduce the amount of times you hear no, simply because the timing wasn’t right for them. Besides the major giving seasons surrounding the holidays, your donors’ preferred donation time may differ greatly. You should employ a management software to organize your donors into segments according to their donation patterns to optimize your fundraising achievements. Don’t allow yourself to waste your time and energy pursuing dead ends. Allow donor analytics tools do the hard work for you so that you can focus on pursuing actionable leads and enhance your nonprofit’s success. 4 Wealth Screening Best Practices for Smart Nonprofits. Learn more about the best ways to assess your donor profiles with these tips for nonprofits. Prospect Generators: 4 Essential Tips to Find New Donors. Don’t get in a fundraising rut! Learn more ways to find new prospects for your nonprofit. Buying Fundraising Software: 6 Important Factors to Consider. Want more information about software features? Check out these important factors to consider.